a) He Who is on this earth with delight by enjoying the association with Hisdevotees. b) One Who gladdens the earth by ridding it of the evil-doers. c) One Who bestows the auspicious world of parama padam. d) One Who delights in the sky, in the form of the sun. e) He Who wears a garland made of blue lilies. The nAma consists of two or three parts, depending on the interpretation. Oneway to look at the nAma is as ku + mudah. The first part is derived from theroot kai - Sabde - to sound. kauti dhvanati iti kuh - that which is fullof sound. The amara koSam gives the meaning "world" to the word kuh- kuh pRthivI prthvI. mudah is derived from the root muda - harshe - torejoice, to be glad. modata iti mudah - One who rejoices, or modayatiiti mudah - One Who makes others rejoice. Another way to look at the nAma isku + mu + dah (see c below). a) SrI BhaTTar interprets the nAma in terms of ku + mudah. His vyAkhyAnam iskau - prakRti maNDale - (even) in this world of prakRti; mudah - (taih saha)modate - (In the company of His devotees) He rejoices. So He is known as kumudah. "I was driven away from My kingdom, I have to live in the forest, I havelost sItA, and now this great bird (jatAyu, the eagle) has beenslain". And yet, He chooses to live amongst us just for thecompany of, and association with, the likes of bharadvAja, atri, agastya, etc. SrI cinmayAnanda interprets the nAma thus: "One Who gladdens theearth", or "One Who is gladdened by the earth". He explains thatbhagavAn's delight is a sheer expression of His Omnipotence - the very fact thatHe has created this dynamic, complex, cosmos that is so scientifically precise,is a matter of delight, since it is the fulfillment of His Omnipotence. He Who frees the earth from its burdens and givesjoy to the beings of the earth. SrI ananta kRshNa SAstry observes that this lightening of the burden is throughthe elimination of the wicked people (dushTa nigraham). SrI rAdhAkRshNa SAstri gives the example of His taking many incarnations for thesame purpose - to destroy the wicked people and protect His devotees. Here is one more instance of seeing the difference in the approaches of SrISa'nkara and SrI BhaTTar in their general approach to their interpretations. SrISa'nkara explains the nAma as His giving joy to the earth by freeing it of itsburdens, and SrI BhaTTar explains the nAma as His rejoicing and derivingpleasure by the company of His devotees. We should keep in mind that both theinterpretations are valid anubhava-s of bhagavAn. The difference in approach isthat one emphasizes His Power, and the other emphasizes His saulabhayam andsauSIlyam. He Who bestows the world of mukti, or parama padam - ku = bhUmi, mu = mukti; dah= Giver or Bestower. Sabdavat AkASe modayati iti kumudah; SabdASraye khe modata iti kumudah sUryah. e) The word kumuda is also used to refer to the blue lily or to lotus. He Whowears a garland made of these is kumudah - utpala dhAro kumudah (SrIbaladeva vidyA bhUshaN). a) The Bestower of the knowledge of the Supreme Reality (kunda-rah). b) He Who dissolves or eliminates the sins accumulated over countless births(kun-darah). c) He Who bestows benefits as agreeable as the kunda flower (kunda-rah). d) He Who accepts offering that are pure like the kunda flowers (kunda-lah). e) He Who pierced the earth in His varAha incarnation in search of hiraNyAksha (kum-darah). f) One Who gives what is sought or what is desired. g) He Who created the oceans by tearing apart the earth (kum-darah). h) He Who is very pleased with the offerings of the kunda pushpa-s by Hisdevotees (kunda-rah). SrI BhaTTar uses the word kundam as referring to "The knowledgeof the Supreme Reality" or para-tattva j~nAnam. This is based on hisinterpreting the term ku as a reference to "mukti-bhUmi",rather than just as meaning "bhUmi". kundam is that which givesthe mukti-bhUmi, namely the knowledge of para-tattva. Since He is the Giver ofthis knowledge, He is kunda-rah (rAti = dadAti = gives). I lovingly grant that mental disposition (buddhi-yoga) by which they come toMe". This is the para-tattva-j~nanam that SrI BhaTTar is referring to. b) The nirukti author has added an interpretation to this nAma, that isborrowed from SrI BhaTTar's interpretation for the next nAma, kundah.This involves the use of the meaning "sin" for the word ku – kumavyayam pApa-vAci, tasya dAraNAt kun-darah – He Who dissolves oreliminates the sins (accumulated over countless births). c) SrI Sa'nkara's vyAkhyAnam is that the nAma signifies that He bestowsfruits that are as pure and agreeable as the kunda (jasmine) flowers – kundapushpa tulyAni SuddhAni phalAni rAti dadAti iti kunda- rah. (based on the root lA – AdAne dAne ca –to take, to obtain) . Here he uses the rule of mutual interchange of ra and lain conventional usage – ra-la-yoh ekatava smaraNAt. kum –dharAm dArayAmAsa hiraNyAksha jighAmsayA vArAham rUpam AsthAya it vA kun-darah. f) SrI vAsishTha indicates the root for the word kunda as kamu – kAntau– to desire, and the application of the uNAdi sutra abdAdayaSca (uNAdi. 4.98),leading to the word kundah. He gives the interpretation kAmayata iti kundahkamanIyah – That which is desired or sought for is kunda. Using the rootrA – dAne – to give, kundarah means "One Who gives what issought or what is desired" – kamanIyam vA'ncitam dadAti iti kunda-rah. He Who is very pleased with the offerings of the kunda pushpa-s by His devotees. a) He Who grants the successive stages of higher knowledge. b) He Who cleanses the sins of His devotees. c) He Who is pure and beautiful like the kunda (jasmine) flower. d) He Who bestows purity like the kunda flower to His devotees. f) One who is sharp like the kunta spear in removing the sins of His devotees (kuntah). g) He Who gave an offering of the earth to kaSyapa Rshi. h) He Who eliminated the bad kshatriya kings from the earth. i) He Who cleanses the earth through the sun, rain, etc. As explained in the previous nAma, the word ku refers to bhUmi as well assin; the word kunda itself refers to the jasmine flower. The previous nAma,kundarah, and the current nAma, kundah, are somewhat similar. The part -dah isinterpreted as dadAti - gives, dAyati - cleanses, or dyati - eliminates, thusleading to the different interpretations. a) We had seen that the meaning "para-tattva-j~nAnam" was given bySrI BhaTTar to the word kunda. kundah is One Who bestows this knowledge.kundarah was also assigned the same meaning earlier. SrI BhaTTar distinguishesthe current nAma from the previous one by referring in the current nAma, tobhagavAn's giving the para-tattva knowledge to those that have started climbingthe steps of knowledge through self-control etc., in steps of para-bhakti,para-j~nAnam, and ultimately parama-bhakti. b) SrI BhaTTar also gives an alternate interpretation. We saw in the previousnAma the assignment of the meaning "sin" to the word ku, and aninterpretation added by the nirukti author for the previous nAma based on thismeaning for the word ku. While we saw the interpretation "He Who destroysthe sins" for the previous nAma, the interpretation given for the currentnAma is "He Who cleanses the sins", based on the meaning ku = pApam,and the root daip = Sodhane - to purify; pApam dAyati Sodhayati iti kundah. Hefirst removes the sins from His devotee (kundarah), and then cleanses the sinsso that they do not get back to the devotee again (kundah) - pApam dArayati itikundarah, api ca vidAritam pApam Sodhayati iti kundah. yad-vA kum = pApam dAyati +Sodhayati iti kundah (do = avakhaNDane, daip = Sodhana). He removes the sins of His devotees, and gives them to the evil-doers as thephalan for their karma-s. Here, the meaning given by the vyAkhyAna kartA-s forthe word kunda is "One Who is pure like the kunda pushpam - the pure whitefragrant jasmine flower". In tamizh, the word kunda can also be consideredas standing for the word kurundam flower - a pure white flower representingpurity. So the nAma can be understood as "One Who is pure like the kundaflower", or "One Who bestows purity like that of the kunda flower toHis devotees". SrI Sa'nkara gives several interpretations for the nAma. kundopama sundarA'ngatvAt svacchatayA sphaTika nirmalah kundah. e), f) SrI v.v. rAmAnujan comments that the term can also be taken to mean"One who has the spear called kunta" - (nin kaiyil vEl pORRi -tiruppAvai). SrI uttamUr vIrarhAvAcArya svAmi also refers to this as onepossible interpretation for the occurrence of this word in nammAzhvAr's pASuram.The nAma in this case will be "kuntah" instead of "kundah".The meaning then could also be "One who is sharp like the kunta spear inremoving the sins of His devotees". "The son of bhRgu, in order to purge all his sins, performed the horsesacrifice. In that sacrifice that required great gifts to be given away, He, inHis incarnation as the son of bhRgu, made a gift of the earth to mArIca withgreat pleasure". kum pRthvIm dyati khaNDayati vA kundah. "Let Hari, the best of the bhRgu family, who made the earth free fromwicked kshatriya-s many a time, and who cut off the thousand arms of kArtavIrya,be with me for the increase of prosperity". pRthivIm varshaNena Sodhayati iti kundah. a) He Who bestows His blessings on the devotees like therain-cloud. b) He from whom a superior birth is attained. c) He Who protects. You who are like the rain cloud for some, like thefire for some, and like the comforting water for many! "Those j~nAni-s who are immersed in bhakti yoga towards You do notsuffer from the tApa-traya-s that are caused by the heat of samsAra". even as the rain-charged cloud cools the earth by itsdownpour". SrI Sa'nkara's alternate interpretation is that this nAma signifies that Heshowers all desired objects on His devotees like rain – sarvAn kAmAnabhivarshati iti parjanyah. pari-jana-s are those that are around Him – those that worship Him; He Whobestows welfare on them is pari-janyah, which is same as parjanyah in SrIbhAradvAj's interpretation. tasyAm cinta-bhUmau varshati nija-rUpa amRtam iti parjanyah –He Who showers His actual Self in the thoughts of His devotees is parjanyah. param janyam yasmAtparjanyah – He from whom a superior birth is attained. c) SrI vAsishTha gives at least six different ways of deriving the nAma,starting from different roots. One of these is pR – pAlana pUranayoh – toprotect, to fill, to bring out; with the addition of the anya pratyaya, thisbecomes parjanyah, which means "One Who protects". a) He Who is the forrn of the wind. b) He Who moves to Hisdevotees to remove their distress. c) He Who purifies in the form of wind, agni,water, etc. d) He Who protects the protectors – the kings (pA + avanah). We saw this nAma earlier in Slokam 32 (nAma 292). SrI BhaTTar indicates the root for the nAma as pavi – to go. The amara koSavyAkhyAnam indicates the derivation from the root pU'ng – pavane; pavata itipavanah; punIte vA; The meanings are thus: that which goes, that which blows,that which purifies, etc. a) SrI BhaTTar's interpretation for nAma 292 was that He has the nAmasignifying that He moves about in the form of the wind, with just a fraction ofHis power. 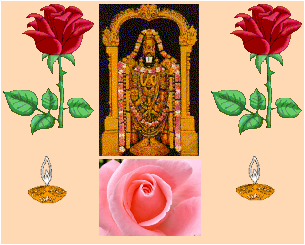 nammAzhvAr conveys this in his tiruvAimozhi pASuram 5.7.3 –kANginRa ik-kARRellAm yAnE ennum…. The ten pASurams in tiruvAimozhi 5.7 sum upthe truth that bhagavAn is everything without exception. "HeWho manifests as the life-giving atmosphere around the world and sustains theexistence everywhere". "Of moving things, I am the wind. Of those who bear weapons, I am rAma". b) SrI BhaTTar's interpretation for the current instance of this nAma is thatbhagavAn goes Himself (pavi – to go) to His devotees to remove their distress- pavate iti pavanah. vandAi; en manam pugunDAi; manni ninRAi – You came of Yourown free will, entered my mind, and have decided to stay there. nammAzhvArconveys the same thought in his tiruvAimozhi 5.7.7 – vandaruLi en ne'njiDamkoNDa vAnavar kozhundE! … aDiyEnai agaRRElE – Oh Lord! You have been kindenough to come and take a place in my heart. Only, now please do not ever leaveme. c) SrI Sa'nkara's interpretation for the current instance of the nAma is thatHe purifies anyone who merely remembers Him – smRti- mAtreNa punAti itipavanah. In the context of bhagavAn being the Great Purifier, SrI rAdhAkRshNa Satricomments in his vyAkhyAnam for the Slokam "pavitrANAm pavitram yah..",that acts such as taking a bath in the holy waters, visiting divya kshetra-s,etc., are ways of our ridding ourselves of sins, when we undertake these actswith the faith and belief that bhagavAn is present in these rivers and divyakshetra-s. Thinking of Him, worshipping His divya ma'ngaLa vigraha-s, singingHis praise, performing pUja for Him, meditating on Him, prostrating, etc., areall ways to remove our sins through His purifying power. SrI cinmayAnanda uses the version "pAvanah" in Slokam 87, and givesthe translation for the nAma as "One Who ever purifies". He commentsthat "The impurities of a personality are gathered when the mind andintellect, in a natural impulse of animal voluptuousness, rush towards thesense-objects with ego-centric passion". The purification by His poweroccurs when we peacefully let our minds settle in contemplation of the divinenature and eternal glory of SrI nArAyaNa. and looks at the nAma as pA + avanah – He Who protectsthe protectors or kings. His vyAkhyAnam is: pAnti iti pA rAjAnah; teshAm avanamyasmAt iti pAvanah. a) He Who need not be goaded by anyone in His blessing thedevotees (an-ilah). b) He Who has no enforcer above Him. c) He Who is easilyaccessible to His devotees (a-nilah). d) He Who is the Giver of life-breath toeverything else. e) He Who is ever awakened. g) OneWho does not have a fixed residence, One Who is in the form of the wind, etc. h)He Who has no end. i) One Who has no binding to pApa, puNya, etc. j) He Who gavethe kingdom (to ugrasena after killing kamsa). k) He Who spent sleepless nights(planning how to save rukmiNi). We looked into this nAma in Slokam 25 (nAma 236). The root word from whichthe nAma can be derived is ila – preraNe – to urge. Apte's dictionary alsogives the meanings: to sleep, to go, to move, to throw, etc., for the word ila (ila–svapna kshpaNayoh – to sleep, to throw). SrI BhaTTar also derives the nAmafrom the root ana – prANane - to live, to breathe. ilA also means the earth.These different meaning and combinations are used in arriving at the differentanubhavam-s below. tadapyaprArthitam dhyAto dadAti madhusUdanah - Whenmeditated upon, bhagavAn madhusudana bestows His blessings on His devotee evenwhen the devotee does not pray for them - vishNu dharma 74.42.
ilati preraNam karoti iti ilah, tad-rahitatvAt an-ilah. a-gahanah – a-nilah - bhaktebhyah sulabhah – Easilyaccessible to bhakta-s.
sali-kal-ani-mahi-bhaDi-bhaNDi-SaNDi-piNDi-tuNDi-kuki-bhUbhya-ilach – which states that theaffix ilach comes after the verbs sal – to go down (salilam – water), kal– to count (kalilam – covered with, mixed), an – to live (anilah –wind), etc. Thus, the meaning given for nAma 236 was – ananAt – ujjIvanAtanilah – Because He sustains the life of everything through life-breath, He isanilah. ko hyevAnyAt kah prANyAt - Whoever can breathe and whoever can live if theAkASa (i.e., paramAtmA) were not there? - (taittirIya nArAyaNa 7); prAnAtvAyur_ajAyata - The wind was born out of His breath (purusha sUktam 14). Notethat in this interpretation, anilah is not equated with air or wind, but as Hisbreath – prANa, that supports the wind and all other life. e) SrI Sa'nkara gives several alternate interpretations for the nAma inaddition to b) above. ilati svapiti iti a~jna ilah; tad- viparItonitya-prabuddha-svarUpatvAt iti vA anilah – ilati means sleeps, that is,ignorant; a condition opposed to ignorance is that of ever wakeful state;therefore, One Who is ever awakened is an- ilah. f) For the instance of the nAma in Slokam 25, SrI rAdhAkRshNa SAstri looks atthe nAma as an + ilah, where ilA refers to bhUmi, used in the sense of supporthere – avidyamAnA ilA AsrayatayA an-ilah. Since He needs no support of theearth, air, etc., He is anilah. g) Or, one can use the amara koSa vyAklhyAnam – na vidyate nilah nilayamsthAnam yasya iti anilah – He Who does not have a fixed place is anilah. h) Another interpretation given by SrI Sa'nkara is: anAditvAt anilah – OneWho has no beginning or end;. SrI rAdhAkRshNa SAstri's interpretation is - nanilIyate naSyati iti anilah. i) One more of SrI Sa'nkara's interpretations is: anAdAnAt anilah – One Whohas no binding. SrI rAdhAkRshNa SAstri explains this as na nilAti Adatte puNyampApam vA – Neither puNyam nor pApam stick to Him. nitarAm lAti gRhNAti aikAntino bhaktAn iti – SinceHe totally attracts the single-minded devotees, He is ni-lah. j) An alternate interpretation by SrI vidyA bhUshaN is that He has the nAmasignifying that He gifted the kingdom to ugrasena after killing kamsa – kamsavada nirjitAyA ilAyA bhUmeh ugrasenAya dAnAt. k) Yet another anubhavam of SrI vidyA bhUshAn is in terms of the sleeplessnights that kRshNa spent planning on how to rescue rukmiNi. The term ilA is usedhere with the meaning "sleep", and the pATham used is anilah. tathAhamapi tac-citto nidrAm ca na labhe niSIti. The dharma cakram writer gives the meaning for this nAma that bhagavAn is inthe form of air, and gives us a view of how important the meditation on thisguNa of bhagavAn is for our life. Without food we can go on for many days;without water we can survive for a few days; but without air, but a few minutes.That is how important air is for our living; and so also is the meditation onvishNu for our spiritual life. He quotes mahAtmA gAndhi in this context - thathe could survive without food for several days (and hasn't he proved it severaltimes! ), but he could not live without prayer for even a day. The air is alsospread around everywhere, just as mahA vishNu is. Our mind wanders aroundeverywhere, and occupies everything, just as air occupies all available space.Man has learned to control and contain air. So also, he can learn to control hismind by constant meditation on vishNu. This is another lesson we can take fromthis nAma. a) He Who feeds His devotees with the Nectar - Himself. b)He Who consumed the nectar after churning the Milk Ocean. c) One Who has anever-living will to give fruits. d) One Whose wishes are failure-proof. e) OneWho is dear to the mukta-s.
f) One Who provides unending means of survival forHis creation. The nAma consists of a + mRta+ ASah. a-mRta refers to undying or eternal, orto nectar. ASah is derived from the root aS – bhojane – to eat. One Whoconsumed amRtam, or One Who gives amRtam to others, is ASah - aSnAti ASayati vAASah. …. tEnum pAlum kannalum amudum Agit tittittu en UNil uyiril uNarvinil ninRaonRai uNarndEnE. "I can feel that He is in my body, flesh and blood, life-breath and thefaculty of thinking. He is sweet like honey, milk, sugar, candy, and whatnot". SrI baladeva vidyA bhUshaN gives a similar interpretation – amRtam ayAcitammoksham ASayati bhojayati bhkatAn iti amRtASah – He Who feeds – bestowsmoksham to His devotees unasked, is amRtASah. b) SrI Sa'nkara gives multiple interpretations. The first one is thatbhagavAn is called amRtASah because He consumes amRta or Immortal Bliss, whichis His Own nature – sva-rUpa amRtam aSnAti iti He also refers to bhagavAn'schurning of the Milk-Ocean and consuming the amRtam from this action in additionto giving it to the deva-s.
c) d) Sri Sa'nkara gives an additional interpretation using the meaning"desire or will" for the word "ASA", and gives the meaningto the nAma as "One Who has an ever-living will to give fruits" –One Who has amRtA ASA – amRtA avinaSvara phalatvAt ASA vA'ncA asya itiamRtASah. SrI rAdhAkRshNa SAstri explains this as referring to "His desiresor wishes being failure-proof – amRta". e) One of SrI satya sandha yatirAja's interpretations is based on the meaning"desire or attachment" for the word "ASA", and the meaning"mukta-s" for the word "amRta-s" – "One Who is verydear to the mukta-s" – amRtAnAm muktAnAm ASA icchA yasmin vishaya itiamRtASah. f) One of the interpretations given by SrI vAsishTha is that bhagavAn has thenAma indicating that He provides for the unending supply of means of survivalfor all His creation - pravAhato nitya-sthAyIdam catur-vidha bheda vibhaktamyathAtadarha jIvana sAdhanAni ASayati = bhojayati iti amRtASo vishNuh. a) He of a Nectar-like body. b) He Who has an immortalform. c) He Who sows and cuts the lives of this Universe continuouslyirrespective of time. The term amRta was explained for the previous nAma. The term amRta means"undying, non-decaying". It is also used to refer to nectar, or amRtam.vapuh is derived from vap – bIjasantAne chedane ca – to sow, to scatter, toweave, to cut, to shave. The term vapu is used to refer to the body, appearance,etc. In their interpretation for this nAma, SrI BhaTTar uses the meaning"Nectar" for the term amRtam, and SrI Sa'nkara uses the meaning"undying". a) SrI BhaTTar's vyAkhyAnam is – bhagavAn has a body that is like Nectar.His devotees meditate on His divya ma'ngala vigraham – His tirumEni, and neverget satiated. BhagavAn is called ArAvamudan (of tirukkuDantai fame). nammAzhvArdedicates tiruvAimozhi pASuram 5.8.1 to 5.8.11 to sing the praise of ArAvamudan– the Nectar that never gives fulfillment of satisfaction, no matter for howlong we stand in front of Him and worship Him. He again calls out to His ArAAmudam in pASuram-s in 2.5.4 (appozhudukku appozhudu en ArA amudamE), 2.5.5 (ArAamudamAi al AviyuL kalanda), 10.10.5 (enakku ArA Amudu AnAyE) , 10.10.6 (enakkuArA amudamAi), etc. SrI v.v. rAmAnujan remind us of emprumAnAr's SrI vaikunThagadyam, where he describes the experience of bhagavAn in SrI vaikunTham –amRta sAgarAntar-nimaghnah sarvAvayavah sukhamAsIta. b) SrI Sa'nkara's vyAkhyAnam is – mRtam maraNam tad-rahitam vapuh asya itiamRta-vapuh – He Who has an immortal form is amRa-vapuh. Immortal means"unconditioned by time". BhagavAn's tirumEni is not made of theperishable material that our bodies are made of, but instead, its constituent isSuddha-sattva material, that is eternal and non-decaying. SrI rAdhAkRshNaSAstri's anubhavam is that bhagavAn who took incarnations as rAma, kRshNa etc.,is giving His darSanam to us still in that form, even after the passage of time,with that same tirumEni (this is precisely the concept behind the arcA rUpam ofperumAL in our temples). c) One of the interpretations given by SrI satya devo vAsishTha ues themeaning "one who sows" for vapuh – va – bIjasantAne chedane ca –to sow, to cut. His interpretation is bhagavAn pravAhanityam idam viSvam vapatisantanoti tathA sarvam antakAle cchinatti – bhagavAn has this nAma signifyingthat He is the One Who sows the seed of life continuously in this Universe, andwhen the time comes, He is the One who cuts it also. He is the One Whopropagates the vistAra dharmA – of propagation of each species from othermembers of the same species, with no violation of this rule anywhere. a) He Who knows all. b) He Who knows all the needs of allHis devotees. This nAma occurred earlier in Slokam 48 - nAma 454.
a) In Slokam 48, SrI BhaTTar gives the interpretation that bhagavAn issarvaj~nah because He knows that He is the antaryAmI in everything – tathAsarvAtmanA AtmAnam jAnAti iti sarva~jnah. SrI rAdhAkRshNa SAstri refers to usbRhadAraNya Upanishad, which conveys this message: idam sarvam yad ayam AtmA (bRha.6.5.7). He knows that He is the best means and the best end (best upAyam andbest upeyam). SrI v.v. rAmAnujan refers us to nammAzhvAr's tiruvAimozhi 4.7.7,where AzhvAr refers to emperumAn as "nirainda j~nAna mUrti" –sarvaj~nan. - yah sarvaj~nah sarvavit (muNDakopanishad 1.1.9); - sa sarvaj~nah sarvobhavati (praSna 4.10); - esha sarveSvara esha sarvaj~nah (mANDUkya 6); - saviSvakRt siSvavid Atmayonih j~nah kAlakAlo guNI sarvavidyah (SvetASva.2.6.2,16). SrI kRshNa datta bhAradvAj brings out the significance of the "all-knowing" aspect through the following words – SrI bhagavAn hi sarvamsarvatra sarvadA sarvathA ca jAnAti – He knows everything, always, everywhere,through all means. He is the Only One Who knows the past, present and the future– bhUta-bhavad-bhavishyAdInAm j~nAnam. He is inside everyone and everything.All the bodies and all the souls are His body, and nothing is beyond His reach.His sarva~jnatvam thus covers everything that is known, and everything there isto know. "You know who Your devotees are that cannot bear separation from You,and who those people are that do not know the value of their association withYou! You know everything else in this universe too! But somehow You do not seemknow the purity and simplicity of the intense pain that I am undergoing rightnow, because You are not giving Your darSanam to me right away!" SrI Sa'nkara bhAshyam for the instance of this nAma in Slokam 48 is "sarvaScaasau j~naSca iti sarva~jnah" - He who is all and who knows all. For thecurrent instance of the nAma, his interpretation is – sarvam jAnAti itisarva~jnah – He Who knows all. The difference is that in the first case hetreats the nAma as sarvah + j~nah (sarvah as a noun or pronoun), and in thesecond case as sarvam + j~nah (as qualifying j~nah). c) SrI cinmayAnanda gives the interpretation as "One Who illumines all– "The Illuminator of all thoughts, all intentions, motives, emotions,and all sense perceptions in an individual". a) He Who can be approached from many paths. b) HeWho has faces on all sides. sarvatah means "from all sides, in every direction, everywhere".mukham means mouth, face, and in a generic sense, to an opening. a) SrI BhaTTar gives the interpretation that the nAma signifies that thereare many ways of accessing and attaining Him. He has not laid down any rule thatHe can be attained only by a particular means and not by another. On the otherhand, He can be easily attained by means that are sometimes inexplicably simple– yena kenApi vyAjena supraveSatvAt sarvato-mukhah. arih prANAn parityajya rakshitavyah kRtAtmanA || (yuddhakANDam 18.28). "Everywhere are Its hands and feet; Its eyes, heads and mouths areeverywhere; Its ears are on all sides; and It exists encompassing allthings". SrI cinmayAnanda gives the analogy of the sun whose light shines in alldirections, or the light from a lamp that shines in all directionssimultaneously. atah sarvato-mukhahsarva-dig-deSa-vartishu bhakteshu mukham asya iti sarvato-mukhah.